Saddlewood is on the latest new construction subdivisions to hit the Fairhope real estate market. The location offers convenience for busy families, close to kids in youth sporting events and grocery stores for mom’s last minute dinner shopping needs. Middle school age children could easily ride their bikes to school or to practices held at Founder’s Park. I live right around the corner from this location off of Booth Road and our family can ride bikes safely to Downtown Fairhope and you will often find us biking it to Waffle House on the weekends or as my kids affectionately refer to it, “house.” The setting is very nice too in my opinion, as it offers the look and feel of being out in the country, yet you have all the conveniences of Fairhope are at your fingertips. 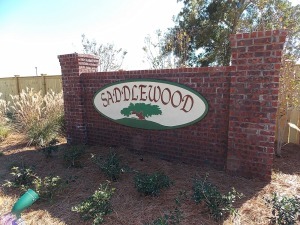 Saddlewood is an 84 lot subdivision, just over 10 miles from Interstate 10. The homes feature solid, low maintenance brick construction on all four sides and are nicely appointed with many upgrades included as standard features, like granite countertops, stainless steel appliances, fireplaces, 12″ ceramic tile floors in all the wet areas and hardwood flooring in the foyer. You should see the model home in person, which displays all the bells and whistles and is beautifully decorated. As of right now, you can still find available spec homes for sale in the mid to even low $200,000 price range. My wife and I own and have lived in the largest floor plan offered, The Mckenzie. It is just over 3,000 square feet with 5 full bedrooms, 3 full baths and formal areas for under $270,000, which is the best price you will find on this particular model home anywhere on the Eastern Shore. This is how these new construction projects typically start out, with low introductory prices. Once a few homes close and the neighborhood begins to become established, the prices tend to go up dramatically. For more information or to schedule a private tour of Saddlewood Fairhope AL, contact the sales office for the Jason Will Real Estate Team at 251-866-6464.